The Sketch I am now am ready to take on a major new artwork. This one has been percolating in my mind for a while. I had this idea for a piece with angels or cherubs in the kitchen. So I did a sketch and the idea transformed from angels in the kitchen to angels in the vineyard. I want to have a view of a vineyard out a window with the cherubs being a sculptures on the sides of the arched window. In my egg tempera paintings I use the same natural ancient pigments that were used by the great masters like Leonardo da Vinci. In fact, I get them from the same places they did. I use a beautiful green earth that comes from Verona Italy and most of my ochers come from the ancient ocher mines in Rousillon France. I crush the stone and earth to make a fine pigment, then I mix it with a bit of water and egg yolk. Read more about ancient pigments and egg tempera. I have been working on the sky and was having trouble getting the feeling I wanted. Yesterday I left the studio frustrated with it and this morning woke up to a sunrise that was exactly what I wanted. Coincidence? A little help from the big guy? Who knows. The painting is kind of in the humble and homely stage right now. The painting is evolving and taking on its own direction. If I try and control a painting too much instead of following the flow it presents me with, the results are never as good. Names for my paintings sometimes come to me as I am creating them and sometimes not until after it is finished. 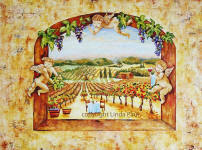 This one wants to be called "Angels in the Vines"
I always work background to foreground and light to dark. So I started with the sky, then the hills and now am developing the background vineyards and vines with an autumn color palette and feeling. My vineyard is inspired from the Napa Valley area. I hope to take another trip out there this spring. When I lived in San Francisco, I often visited the wineries of Sonoma Valley and Napa. I have lightened the sky a bit, worked on the background landscape and the window arch . I have given the front wall some texture and color. 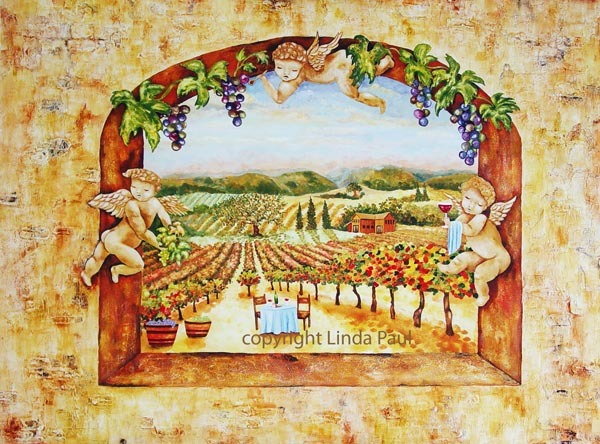 Now I will start on the winery, cherubs and hanging grapes on the arch of the window. My plan is to make the cherubs like little sculptures, they may take their own direction as I begin to paint them. We'll see. Working on the angels has been quite slow but very rewarding. I love the direction my painting is going. I am fussing over what colors to use on the items that the three angels are holding. The angel on the left is holding grapes, the top angel is holding a cooking spoon and the angel on the right is holding a wine glass and serving towel. I have just about completed the grapes. I grow grapes on the fence of my yard in Colorado and I always love when they are turning from green to purple.